Should Lake Okeechobee, a lake half the size of Rhode Island and usually at the center of South Florida’s water woes, be kept lower? That’s the question that rebounded Wednesday, a day after the state’s new governor said he’d asked President Donald Trump in a Jan. 4 letter to order the U.S. Army Corps of Engineers, already in the midst of a major overhaul of the lake’s operations, to keep the water level lower. Gov. Ron DeSantis said levels should be reduced to 10.5 feet, about two feet lower than a management plan put in place in 2008 after Hurricane Katrina forced engineers to revisit aging flood control structures across the country. 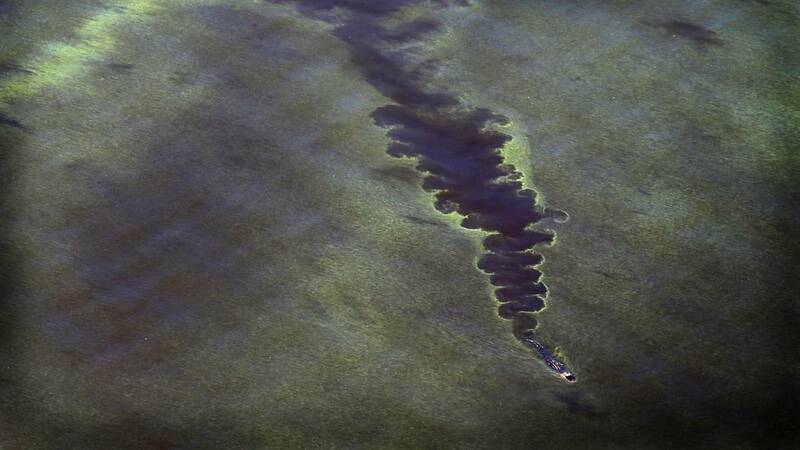 Lowering the lake could help reduce rainy season discharges that often bomb the coasts with too much fresh water or leave the St. Lucie and Caloosahatchee rivers slimed with algae blooms from the polluted water. But environmentalists have often warned that lowering the lake could damage its fringes, prime hunting grounds for bass fisherman and home to protected snail kites. Farmers and utilities also worry that lower winter levels could hurt water supplies. As Everglades restoration projects are completed, a lower lake might also impede efforts to send more water south to wilting marshes., according to a 2018 University of Florida report that looked at differing lake levels. 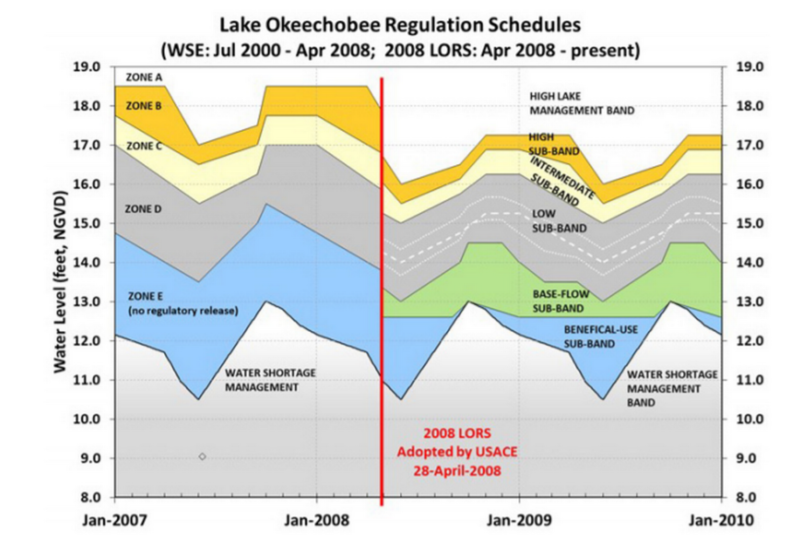 For those reasons, the Corps planned a more measured series of meetings around South Florida to gather input as they revise lake operations. The agency moved up the planning work so the new schedule could be in place by 2022 when it expects to complete $1.7 billion in repair work to the Herbert Hoover dike, a 143-mile mostly dirt dike built just before, during and after World War II that cut off water to Everglades marshes. The agency moved up the deadline in July after getting $500 million in hurricane money to hasten repairs. But this year’s algae blooms, which coincided with a massive red tide in the Gulf Coast that littered beaches with dead sea turtles, dolphins and other marine life, along with a heated election, revised the calculus yet again. DeSantis’ office did not respond to a request for more information about his plan on Wednesday. The Corps plans to hold a press call-in, followed by a public briefing call, on Thursday. Historically, the pliant lake swelled and shrank with the seasons. During the rainy season, it expanded its boundaries and sometimes got 20 feet deep, sending sheets of freshwater south to marshes and bays. Then it shriveled during the dry season. But when South Florida was drained to make way for farm fields and development, the lake was essentially converted to a reservoir, with one big problem: during the rainy season it often filled up faster than it could be drained. Through the 1970s, the lake was kept higher to provide water supply, mostly to farmers. But when it became clear the high water was harming wildlife, levels were lowered. Levels below 10.5 feet usually trigger water conservation orders. Decades of efforts to clean the polluted lake have also failed. The Corps says it’s possible to deviate from the schedule, although the agency would still need to consider environmental impacts. And environmental groups say lowering water levels around the lake this year, which is still recovering from 2017 flooding during Hurricane Irma, could help it recover. “You wouldn’t want to do that every year, but this year it would be kind of like taking your medicine,” said Paul Gray, Okeechobee science director for Audubon Florida. “You gotta remember with Lake O management, it’s 50 percent what we do and 50 percent what mother nature does. It’s half out of our control.”The Corps will hold seven public meetings, from Miami Gardens to Clewiston, in February. For times and locations, visit www.saj.usace.army.mil/LOSOM/.